In the year to end December 2016 new build house prices rose on average by 6.0% across the UK which is slightly down on last year’s figure of 6.9%. But if Greater London is taken out of the calculation and we take a crude average of the remaining regions, then the average house price growth is 4.3% compared to a figure of 4.2% last year. LSL Land & New Homes comments: “In December 2015 East Anglia had seen the fastest annual house price growth with a figure of 9.1% but in the year to December 2016 this region has fallen to 7th position at 4.4%. Notwithstanding reports of price falls in some areas of prime London, the Greater London area has regained the lead position with annual growth of 9.7%. Whilst earnings are significantly higher in Greater London, this does little to compensate for the very significant difference in average residential property prices. In fact a clear North South divide is evident with: Greater London, South East, South West and East Anglia having a HPE multiple at 5 or above and the remaining regions being below this number. 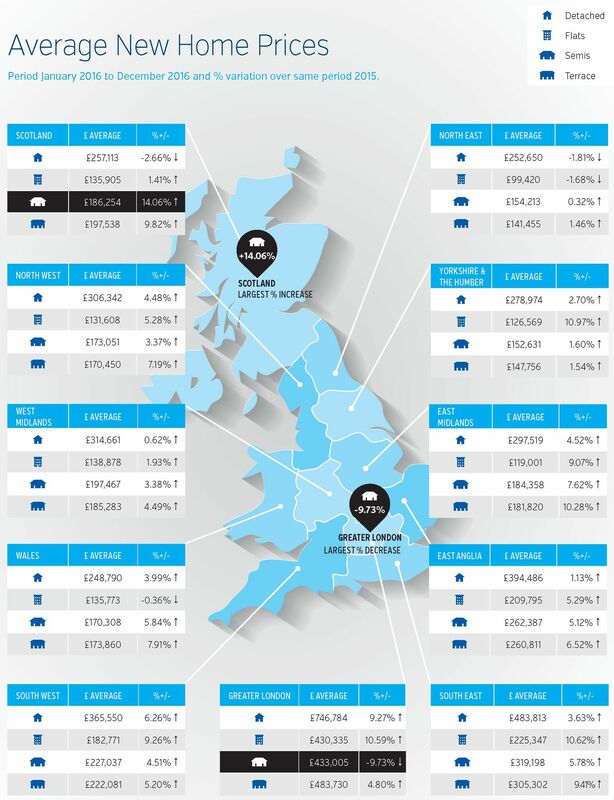 The most affordable regions for first time buyers are the North East and Yorkshire and the Humber which both have multiples below 4.